The Smolyan Filial of Paisii Hilendarski University of Plovdiv is a successor to the Teacher Training Institute opened in 1962 as part of the old Bulgarian tradition in teacher training. At the beginning of 1997 (by government decree №15 of Jan 27 1997) the Institute was promoted to an Filial to Paisii Hilendarski University of Plovdiv (with a legal entity status). The Filial building is situated in the central part of the town near the Planetarium, the Language School, the Technical College of Paisii Hilendarski University, the students' Residence Hall and the High School Students' Hostel. There is a large yard with a lot of green vegetation in front of the main building. The Smolyan Filial of Parsii Hilendarski University of Plovdiv has been winning recognition and has been developing as a prestigious educational and scientific centre contributing to the enrichment of the educational and cultural traditions in the Central Rhodopes and the teaching practice in high schools. It meets the region requirements of qualified specialists with higher education for the needs of tourism, business and management. 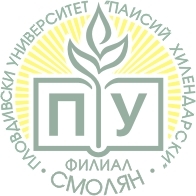 Tourism, Marketing, Bulgarian and English, Bulgarian Language and History, History and Geography, Primary School Education and a Foreign Language (English), Mathematics and Computer Science, Ecology and Environmental Pollution Control. Master's programmes approved by the Academic Council have been provided too. The Filial offers Bulgarian language teaching to foreign students during the first year of their education. The Filial offers pre- printing services of students' books and handbooks, annuals and conference collections. The Filial of Smolyan has excellent facilities for educational scientific - research and creative activities which have constantly been improved and expanded: seventeen auditorium, twenty classrooms, nine scientific and technical laboratories, three computer rooms with Internet access, with multimedia systems of teaching, a video room, two gymnasiums and an indoor tennis court; facilities for creative and sports activities and recreation; an Academic Hall and a Conference room; a library. The Students' Residence Hall contains 320 beds for students and 21rooms for visiting lecturers. They can have meals in a well-run students canteen. The Filial has partnership relations with universities in Greece and Poland in working out joint projects, as well as carrying out students; and lecturers; exchange. The students have the opportunity to be educated for a certain period (one semester) in similar subjects at the Universities of Lublin (Poland), Komotini (Greece), Edirne (Turkey).